If you are like me when I was growing up, I was fascinated with dinosaurs. Dinosaurs are awesome, cool, and sometimes… dangerous. If you are interested in the latest Jurassic Park movie, Jurassic World, you might want to consider the question of how dinosaurs relate to the Bible. In the following blog repost from our 2013 Facts and Faith Symposium (with some edits here and there), you might discover that thinking about dinosaurs and the Bible can get rather… dangerous. But does it really need to be that way? Mary Schweitzer. 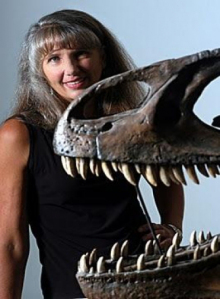 A mother, North Carolina State University researcher, and innovative dinosaur tissue detective……..Or is she a dupe, misled by her scientific colleagues? What happened to the dinosaurs, and how were they destroyed? This is a hot question these days, in view of the recent dinosaur discovery in southern Utah. According to National Geographic, researchers have found a new ancestor to the terrifying Tyrannosaurus rex, nicknamed the “King of Gore”. This is an eery reminder of yet another famous discovery of yet another dinosaur …. in Hell. That’s correct. You heard me right. There are dinosaurs in Hell. On the passing of an incredible witness and wonderfully powerful person, Ginny Woodward. Chi Rho. These words of Scripture are often found inscribed on gravestones of children who died at a very early age, especially in Jewish cemeteries where Jewish mothers expressed the almost inexpressible feelings of their hearts as they laid their children to rest. So, When is a Day Not a Day? For most of church history, Christians have generally considered the “days” of Genesis 1 to be normal, 24-hour periods. There was no serious challenge to this view until the age of modern science. But this does not mean that the “24-hour” view of the Genesis 1 “days” has always been held universally. There have been notable exceptions, namely from the 5th century Saint Augustine. Nevertheless, there are some Christians today who make the argument that the six “days” of Genesis 1 must always mean “24-hours” each. Let me say up front that I stand with Saint Augustine on this one, that the exact meaning of the six “days” of Genesis is difficult to determine. Are they 24-hour periods or could they simply be long, indeterminate lengths of time? Saint Augustine did not know for sure, and neither do I. Saint Augustine was a lot smarter than I am, and he lived a long time before me, so I will put my lot in with him. However, I do get greatly concerned when some insist that their view of a “24-hour” day is the only faithful way of reading the six “days” of Biblical Creation. This implies that the “24-hour” day view should be some test for Christian orthodoxy. Anything that wavers from this is a compromise of Biblical authority. Thankfully, not everyone in the “Young Earth Creationist” camp takes this kind of rigid approach. But for those who do, this way of thinking is very harmful to the unity and testimony of the Body of Christ. So I would like to tackle one of the primary arguments used to defend this position, acknowledging that not everyone goes to such extremes with it. Here on Veracity, we talk quite a bit about three different models that Christians use to understand the “how” questions of Creation: How did God created the world? How long did it take God to create? Definitions are important, and here at Veracity, we go at great lengths to try to properly use these terms in such a way that respects and submits to the “plumb line” of Holy Scripture, the final standard for Christian authority. Each of these views, “Young Earth Creationism,” “Old Earth Creationism,” and “Evolutionary Creationism,” have various strengths and weaknesses to them. Here at Veracity, we discuss different topics like this (and many others!! 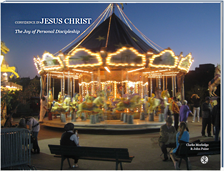 ), offering different points of view, challenging one another to think about what we believe. As you study these topics, you get to decide which viewpoint makes the most sense and which view is the most faithful to God’s Word. As Veracity founding-blogger, John Paine, reminds me, Veracity exists not to tell people what to think, but rather to encourage people how to think. Recently, I have been invited to participate in Table Talk sessions for a discussion on Genesis 1-11 with our lead pastor, Travis Simone, during the Summer Bible Study at our church. You can view the latest session here with some commentary, as well as explore other blog entries related to the topic. Recent topics in this series include “Genesis: History, Fiction, or Neither?,” “Tim Keller on Interpreting Genesis,” and “Does Genesis 1 and 2 Contradict One Another?” Simply browse the latest blog entries, or look for the “Search” option on the right hand side of the blog, and punch in something like “creationism” or “genesis,” and then click on “go” to pull up some articles that might help you think a little more deeply on these subjects. Thank you for stopping by Veracity! “What kind of days these were it is extremely difficult, or perhaps impossible, to determine” (Saint Augustine, City of God 11.7). We live in an age when the Bible is surely under attack by those who reject its authority. In response, many well-meaning Christians feel compelled to defend the Bible against such attacks by insisting on the “literal interpretation of the Scriptures,” beginning right with Genesis 1. To this point, we simply can not dismiss the Bible because we dislike what it says. But is the appropriate objective really to defend the “literal interpretation of the Scriptures,” or is it to defend the faithful and correct interpretation of the Scriptures as the Biblical writers originally intended them to be understood? One might think these objectives are identical, but depending on how one values the use of metaphor in Holy Scripture, the answer may be surprising. My contention is that no one interprets everything in the Bible in a strictly literal sense anyway, and a good look at Genesis 1 demonstrates this. Furthermore, unlike fairly recent debates concerning God’s purpose for human sexuality and marriage, the debates over how to interpret such matters as the “days” of Genesis 1 have been with us for centuries. In contrast, the Genesis teaching on sexuality and marriage has a strong and unified consensus behind it throughout church history. In the 5th century A.D., Saint Augustine dedicated a book on The Literal Meaning of Genesis in order to tackle the subject of how to rightly interpret this early part of the Bible, including those controversial “days” in Genesis 1, hundreds of years before Charles Darwin was ever born. Augustine’s conclusion, noted above from the City of God, is but one example to show that those who love God’s Word for multiple centuries have puzzled over at least some of the details in the first book of the Bible. Augustine wrote The Literal Meaning of Genesis specifically to refute attempts to over-allegorize Genesis, so this should not be taken as an excuse to interpret the Bible any way we want. Instead, we must seek the most faithful reading of the text as originally given and submit to its teachings. But before I get into the subject at a deeper level, it might help to gain an overview of the different options regarding how different Christians have interpreted Genesis 1. Our lead pastor, Travis Simone, sat down with me during a “Table Talk” session during the worship service last week to discuss the topic.